Geertje (/Gertrude) Grondman-van Brug (ab. 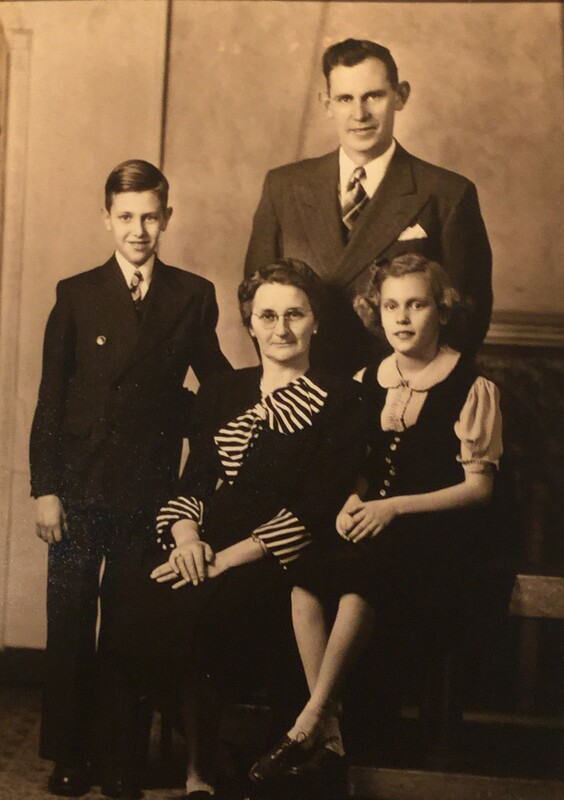 40 yrs) with her husband William Cornelius Grondman Sr, her son Bill and daughter Martha), ~1942. William Cornelius (Sr) Grondman (son of Willem Cornelis Grondman and Klara Beverwijk), born 30 Aug 1902 in Amsterdam (NL), deceased 11Feb 1983 (80y) in Grand Rapids (Kent, Michigan, USA), buried 1983 in Woodlawn Cemetery. He married Gertrude van Brug (daughter of Gurbe van Brug and Martje Lemstra) in Michigan., She was born 24 Dec 1899 in the Netherlands and deceased 31 Aug 1989 (89y) in Wyoming, Kent (Michigan, USA). See the Grondman family tree and the Van Brug family tree. William is born in the Netherlands (Amsterdam, NL) but he grew up in Michigan. His parents (Willem en Klara) left the Netherlands definitively with their little son (William almost 2 years old) in order to emigrate to the USA. It was a long way on a steamship and Klara was pregnant (of daughter Grietje/Grace). Finally they arrived with the steamship "Noordam" on Ellis Island at New York at the 24th of June 1904*. Afterwards they went to Michigan, where they got, besides of Grietje (1904), still more kids: Berend (Ben, 1908) and Anna Marie (1915). The parents of Gertrude (Geertje) are Gurbe van Brug (a professional sailor) and Martje Lemstra. Gertrude was born in Friesland (NL) as “Geertje”. It seems that the family went to live in Amsterdam (family records seems to be present of Gurbe, Antje and Geertje). The parents stayed in Holland but Gertrude (Geertje, 23 yrs) left Amsterdam together with her 3 years elder brother William (Bauke, 26 yrs old). They arrived with the steamship "Nieuw Amsterdam" in the USA at the immigration desk of Ellis Island in New York at the 4th of August 1923*. Many years later (1956, by plane with flight nr KL603 *) Gertrude visited the Netherlands to see her sister(s). Her elder sister Antje (born in 1893) stayed in Amsterdam (where she was married since 1922 with Cornelis Anthoon de Jong). 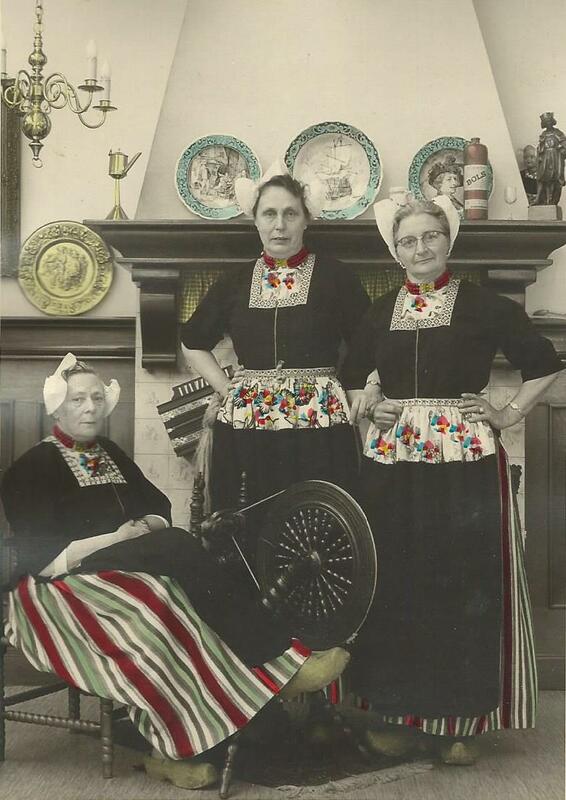 A picture has been made of her and her sister and another lady in folkloric Volendam costumes. Apparently that second lady was not another sister, because no records have been found to confirm that fact.